The last thing any corporation wants to hear is ... the truth! How one businesswoman's super-heroic compulsion to confront hypocrisy leads her to battle Big Pharma, boozy bosses, and the fractured family fantasies that fueled her fight for Justice. "The Fiery Sword" Named Fringe Festival Favorite! 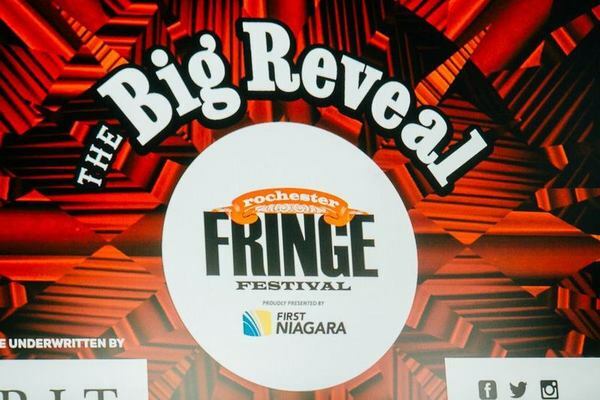 The Rochester Democrat & Chronicle named "The Fiery Sword of Justice" one of its "Fringe Festival Favorites," capping 10 delirious days of theater and entertainment at the Fourth Annual First Niagara Rochester Fringe Festival. Thank you, Rochester -- it was a privilege to bring Justice to your great city. Rochester Loves The Fiery Sword! "Lauren Letellier's journey through the corporate world is something many of us can relate to... [She] makes us laugh as those situations but also may inspire people who hate their jobs to look for another path. Regardless, her intimate rant on workplace dysfunction is universal." The Fiery Sword of Justice heads up the Hudson River to Stageworks/Hudson for one night only on June 12th at 8:00PM! Tickets: www.stageworkshudson.org. See the show that SOLD OUT at The New York International Fringe Festival and won rave reviews from critics who called it "bold, funny, wise and brave," "a corker of a story -- wicked, sharp and funny" and "rich with heartache, humor, corruption and longing for the truths in life." Now you can bring "Justice" to your theater or community event. For performance bookings, speaking engagements or media requests, contact LaurenLetellier@gmail.com. Check out my interview with Therapist, Career Coach and Forbes.com Blogger Kathy Caprino, who attended the show on Aug. 16th. "As a corporate VP turned therapist and career coach, I’ve spent years dissecting my own life: exploring my childhood, my development to adulthood, and the key themes that have followed me into my professional life. I’ve always suspected – then came to realize with great clarity — that our professional identities and behavior simply can’t be divorced from who we are as whole persons. When my friend Mary Lou Quinlan, award-winning marketing expert turned bestselling author, actress and playwright of The God Box introduced me to Lauren Letellier, also a business executive turned playwright and actress, and told me I had to see Lauren’s new play, I listened. My daughter and I saw Lauren’s one-woman show, The Fiery Sword of Justice Saturday night in New York City, and were riveted and moved." A Rave Review for The Fiery Sword from StageBuddy.com! Another Rave -- from NY TheatreGuide!